The cultural, commercial and financial center of Northern California, San Francisco is one of the most populous yet consolidated cities in the U.S. Well on its way to being home for more than 1 million people plus daily tourists, the streets of San Francisco are unfortunately not yet immune from car accidents. If you sustain injuries from a Bay Area accident, call the award-winning San Francisco car accident lawyers of Walkup, Melodia, Kelly & Schoenberger. With more multi-million awards for our clients, victims of negligence, than any other Northern California injury law firm, you can trust our legal team to fight for your maximum compensation. Why Hire a San Francisco Car Accident Attorney? What Type of Compensation can I Recover after my Car Accident? What to Do After a Car Accident in San Francisco? In such a busy metropolitan area, car accidents are bound to occur. In the span of one year, 4,791 people died or sustained injuries in car accidents in San Francisco. Car accidents have typical causes, most of which have to do with driver error and negligence. When you or a loved one has been injured in a car, truck or motorcycle accident, it is critical that you speak to a skilled and experienced personal injury accident attorney as soon as possible. If you wait too long, critical physical evidence relating to a fault and injury causation may be lost, witnesses may disappear, and memories of police investigators, first responders and witnesses may fade. At Walkup, Melodia, Kelly & Schoenberger, our San Francisco car accident lawyers have spent 60 years recovering money for and helping rebuild the lives of those hurt by the carelessness of others in all types of motor vehicle accidents. To schedule a free consultation to discuss your case, call us at (415) 981-7210 today. After a car accident, victims often have questions. They may not know who is at fault or who will pay for damages such as a totaled vehicle or hefty medical bills. With simple to complex car accident cases, it is important to speak to someone who is knowledgeable about San Francisco traffic laws and your personal rights. We know that being injured in a car accident, regardless of the severity, causes anxiety, difficulties, and challenges — insurance paperwork, telephone calls from insurance adjusters, doctor’s visits, bills, absences from work or school, pain and disability. It is easy to feel isolated and overwhelmed in the face of everything having to deal with a car insurance accident claim. That’s why you need to be represented by respected and experienced San Francisco car accident attorneys after an accident. We have been helping people injured in automobile, truck and motorcycle accidents for more than 60 years. We know the issues that arise. We have dealt with doctors, bill collectors, claims people, auto insurance adjusters, and lien holders. We have the experience and the staff to handle every aspect of your case. When the Walkup’s San Francisco car accident attorneys take over your case, we immediately begin the process of investigation and evidence collection to secure and preserve evidence. We work with skilled engineers specializing in accident reconstruction, auto engineering and design experts, retired police officers, and professional investigators. We have the resources and experience to prove your case. Our goal is to ensure that you receive full and fair monetary compensation for your injuries. We work to protect your financial interests. If the responsible insurance company will not make a reasonable offer, we have the resources, skill, and experience to file a lawsuit on your behalf and litigate your claim, and if we still cannot settle your case, we will take it to trial. At Walkup, Melodia, Kelly & Schoenberger, our car accident lawyers have helped thousands of people like you recover the money you have lost, as well as compensation for what you have gone through. San Francisco is one of just a handful of cities in America with arterial thoroughfares instead of multiple highways. Arterial thoroughfares are high-capacity urban roads, necessary in San Francisco due to the city’s unique geography. There are only a few main arterials in the city that the majority of road traffic must traverse. This leads to heavy traffic and congestion. 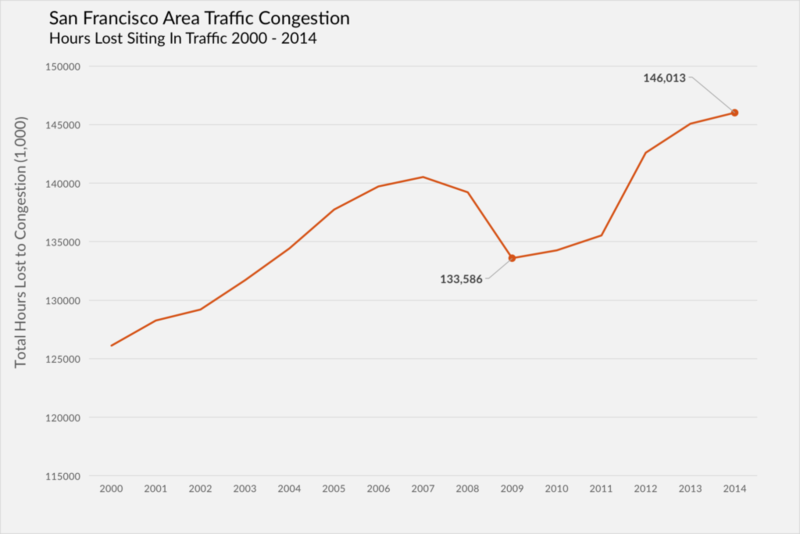 According to mobility data of the San Francisco-Oakland area, there is an average of 6.6 hours of “congested time” on the roadways, resulting in total delays per peak auto commuter of 78 hours annually (per person). Van Ness Avenue. This arterial road goes through the heart of the city, toward the Golden Gate Bridge. Fell Street, Fulton Street, and Lincoln Way. All run along the Golden Gate Park, traversing the western part of the city in an east and south direction. Other major roads include California Street, Geary Boulevard, Grant Avenue, Market Street, 19th Avenue the Great Highway and Park Presidio Boulevard. Traversing any of these arterial roads poses threats to drivers and bicyclists, due to heavy traffic volume. Collisions in bumper-to-bumper traffic can cause injuries such as whiplash or more serious harms to pedestrians, bicyclists, and motorcyclists. The Central Freeway, Bayshore Freeway, and the Highway 280 Extension are three other areas with high traffic and increased risk of car accidents. These risk factors cause the majority of all car accidents around the world. According to the Centers for Disease Control and Prevention (CDC), seat belt use is the best way to avoid injuries and fatalities in car accidents. Yet millions fail to buckle up every day. About 53% to 59% of teenagers (ages 13 to 19) and adults (ages 20 to 44) who passed away in car crashes were not using restraints at the time. Properly restraining small children can reduce infant deaths in car accidents by about 70%. Restraints save lives in every type of collision. Unfortunately, vulnerable road users like pedestrians, bicyclists, and motorcyclists become involved in hundreds of car accidents every year. The odds of catastrophic and fatal injuries are higher in victims of these crashes. Even a low-speed rear-end collision can launch a motorcyclist from his/her bike and cause serious injury. It is every driver’s duty to pay attention to the road and follow local laws to prevent collisions. From 2015 to 2016, more people died in California car accidents than the national average, based on research by the National Safety Council (NSC). According to the manager of the NSC’s statistics department, California’s rise in crash fatalities is due in part to the recovering economy. More people are on the roads in California, leading to a natural rise in car accidents. Safety problems also come into play, such as cell phone use behind the wheel and drivers under the influence of prescription medications. In 2014 (the most recent year for which data is available), 463 people in San Francisco County died or sustained injuries in alcohol-related vehicle accidents. In three of these crashes, the drivers were underage drinkers. The same year, there were 379 deaths/injuries from motorcycle collisions, 887 deaths/injuries in pedestrian accidents, and 645 in bicycle accidents. Speed-related crashes were the most common in the county, with 863 fatal and injury collisions in 2014. In the city of San Francisco, drivers under the age of 30 are involved in the most collisions. Interestingly, there were four reported collisions in the city involve drivers under the age of 10. Reading about car accident statistics is one thing – living through it is another. Car accidents can be extremely traumatic, leading to debilitating injuries, emotional trauma, post-traumatic stress disorder, and lifelong pain. For all the anguish someone else’s negligence has caused you, take back your life with a personal injury lawsuit. Filing a claim against the defendant(s) can shed light on his or her mistakes, and potentially prevent the same type of crash from occurring in the future. It can also give you money to pay for medical care, therapy and rehabilitation so you can begin the journey toward healing. Car accidents are unique in that they can cause injury to virtually any part of the body. The terrible reality of car accidents is that three separate collisions occur in each one. The first collision is when the vehicle strikes another object. In this collision, the vehicle absorbs kinetic energy and helps to somewhat protect the people within the car. The second is the human collision, in which the passengers inside the vehicle strike an outside force (i.e. the steering column, seatbelt, or airbag) and stop the movement they had before the accident. In the human collision, injuries such as broken bones, fractures, and lacerations can occur. Head and brain injuries. Skull fractures in the human collision may not cause brain damage, but injuries such as concussions, blunt force trauma, and penetration injuries can affect the brain. Hematomas (bleeding in the brain) and swelling can occur, leading to temporary or permanent brain damage. Back injuries. The fragile spinal cord can sustain major damage in an accident, leading to lifelong back pain or even paralysis. If the spinal cord suffers an incomplete injury, the victim could experience a partial loss of movement and feeling. A complete spinal cord injury can leave a victim paralyzed below the level of the injury. Neck injuries. Whiplash is one of the most common neck injuries in rear-end collisions. Whiplash occurs when an accident causes the neck’s muscles, nerves, tendons, and discs to bend forcibly forward and backward. Fractures of the top two spinal cord vertebrae, C1 and C2, can lead to the most severe type of spinal cord injury, wherein the victim suffers full paralysis. These fractures are often fatal. Chest injuries. In a major impact to the chest, a car accident victim can sustain broken ribs and a condition known as flail chest. This is a life-threatening injury in which a portion of the rib cage breaks off and separates from the rest of the chest wall. Victims can also suffer traumatic cardiac arrest in an accident or collapsed lungs. Other common car accident injuries include broken bones and ligament damage. These injuries can lead to temporary disability and missed time at work, as well as some lifelong effects. Torn ligaments or slipped discs can cause chronic pain and may require surgery to alleviate symptoms. Many car accident injuries are fatal, resulting in wrongful death. If a loved one passed away in a car accident, consult with one of our attorneys. We care about each of our clients and want to help you pursue justice for a life cut short. What is the statute of limitations for car accident claims in California? The statute of limitations is the deadline by which an accident victim must file a claim with the civil courts. After this deadline, the courts can refuse to hear your case. In California, you have two years from the date of injury or the date of discovery of injury to file a personal injury claim. You have three years to file property damage claims. If you’re filing a claim against a government agency, you must do so within six months of the incident. Is California a no-fault auto insurance state? California is NOT a no-fault state. This means that the courts must find the person who injured you responsible for causing the accident before the person’s insurance company must pay damages. In no-fault insurance states, there is no requirement to prove the individual’s fault, and the accident victim makes a claim with his/her own insurance company. How does one prove liability? Proving liability is something that should always be put in the hands of a skilled attorney. Your attorney can use eyewitness accounts of the crash, video surveillance footage, photographs of the accident scene, type of damage to vehicles, and other means to collect evidence against an at-fault party. A team of experienced attorneys makes the investigation and discovery phases of a claim much easier on accident victims. The state of California has dozens of specific laws and statutes in place regarding car accidents and the process for filing claims. The attorneys at Walkup, Melodia, Kelly & Schoenberger can help you understand these laws after a harmful collision in San Francisco. Don’t attempt to navigate a complex car accident claim alone. Protect your rights by retaining an attorney with experience and knowledge. Medical bills, including ambulatory fees, hospital stays, scans and X-rays, surgeries and procedures, and prescription medications. These costs can also include medical equipment such as wheelchairs, home or vehicle modifications for a permanent disability, and live-in care. Property damage. The courts can make the defendant pay for damage to your vehicle or other properties, including items in your vehicle that sustained damage in an accident. This can include expensive guitars, radios, or anything else within your vehicle, as well as the vehicle itself. Lost wages. If you had to miss work because of your injuries, you can list these damages in your lawsuit. Include lost wages, a lost capacity to earn (due to a disability), and lost workplace opportunities, such as raises or promotions. Noneconomic Damages. Noneconomic damages in a car accident case can include physical pain, emotional suffering, mental anguish, and lost quality of life. In cases involving permanent disability such as paralysis, the courts will grant higher awards. There is no damage cap on car accident compensation in California. There is, however, a cap on medical malpractice cases in the state ($250,000 maximum for noneconomic damages). It is possible to receive punitive damages in a car accident case involving the defendant’s gross or reckless negligence. Punitive damages punish the defendant for particularly irresponsible actions, such as driving while heavily intoxicated or intentionally crashing into the victim’s car. To get an estimate of the exact compensation amounts in your case, talk to a lawyer. What are Car Accident Settlements Based On? The courts base car accident settlement amounts on your actual damages (economic damages), including the number of your medical bills and lost wages. To measure your noneconomic damages, the California courts will examine the amount of pain and suffering the victim incurred, taking into account pain, disfigurement, disability and emotional suffering. There is no exact rule that decides how much noneconomic compensation a car accident victim recovers. How are they Paid? When a plaintiff receives a settlement offer or judgment award, the defendant’s insurance company will typically mail a check in a matter of weeks after the final court decision. Are Car Accident Settlements Taxable? In state court, car accident settlements are non-taxable. You would not include settlement proceeds in your yearly income. However, the Internal Revenue Service (IRS) does have exceptions to this rule. Certain types of compensation are taxable, including most punitive damages. Talk to your attorney about the tax on your specific awards. After a car accident, remain calm and call the police. Report your accident to authorities even if it’s minor, so there will be official documentation. Gather as much information about your accident as possible, including the other driver’s name and contact information. Take photographs of the scene of the accident if you can, as well as any property damage or personal injuries. Keep documents such as the police report and medical statements regarding your injuries. Once you’ve reported the accident to your insurance company, your next phone call should be to Walkup, Melodia, Kelly & Schoenberger. Our attorneys have decades of collective experience in car accident law in California and around the country. We have the education, resources, and firsthand experience to maximize your odds of taking home compensation. After a car accident in San Francisco, don’t hesitate to schedule your free consultation with our competent and caring lawyers. Call (415) 981-7210 to contact us today. At Walkup, Melodia, Kelly & Schoenberger, we have helped thousands of families like yours achieve significant verdicts and settlement offers. See how we have helped past clients; then, let us help you. “They held us by the hand and walked us through the entire sequence. The settlement was more than we expected. The attorneys did the best job I could ever imagine. They pulled me through this whole miserable time and stood by me.” – Jason M.